Bringing fitness to the forefront | Spa Inc. Fitness classes, yoga, and outdoor activities complement the wellness experience at a spa and can be the perfect match for the treatments offered. “It’s a wonderful pairing and I’m surprised more spas don’t have fitness offered in their facilities,” says Kim Kraushar, co-owner and fitness director at Interlude Spa in Nova Scotia. Spa-goers are aware of the importance of taking care of themselves, and fitness is a natural extension of body care. Madeleine Marentette, founder of Grail Springs in Ontario, says clients are becoming aware that there are many components to a healthy lifestyle. Keeping active is one of those components. 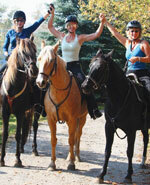 Grail Springs owns 100 acres of land and clients enjoy a range of outdoor activities such as nature walks, canoeing, snowshoeing, and horseback riding, as well as daily yoga classes. Other spas offer yoga passes at monthly increments. Fitness programs are easily paired with body treatments. A client may take a class then have a massage afterward to relax sore muscles. Interlude’s Awakening package begins with a one hour private STOTT Pilates class, followed by a massage, manicure, and hair style. Introducing fitness is an investment. You have to consider space, training, and a business plan to recoup that investment, says Krausher. She adds the fitness industry is vast and spa owners may feel overwhelmed. “You need to do your homework before you invest in something,” she says. One option is to attend conferences and workshops to stay current on developments in the fitness industry. Understanding your clientele, and your spa’s philosophy, will help determine which activities to introduce. It may be your clients will be less responsive to a Hot Power Yoga Dance Party class as they are to a Nia class. Grail Springs recently introduced Nia, a popular fitness technique that fuses the “healing arts” such as yoga with movements from the martial arts and dance for a unique fitness experience. “We like to change it up. Bring different philosophies, different techniques. It keeps everything fresh,” says Marentette. Marentette says her clients were not as responsive to indoor cardio classes as they were to outdoor activities. “We noticed when we offered outdoor activities, everybody would attend. And then we’d offer the indoor cardio workout in the morning, and nobody would,” says Marentette. “They want to come here and do something different.” Marentette decided to convert the indoor gym into a spacious yoga studio. Observe which types of programs your clients respond to and tailor your services accordingly. For a city spa, introducing a fitness program can be a challenge due to space restrictions. A spa looking to include yoga could do a collaborative exchange with a nearby yoga studio says Marentette. The spa and the studio promote each other to clients and offer discounts and specials. “Collaboration is key if you don’t have the space, because yoga’s not very lucrative. People don’t want to pay more than $15 a class, so unless you’ve got a huge space to bring in the volume, you could lose money,” she says. That being said, the addition of yoga or another fitness option could be just the thing to keep your customers coming through the door, and enjoying spa treatments along the way.